Shane Patrick Victorino (born November 30, 1980), nicknamed "The Flyin' Hawaiian", is an American professional baseball outfielder who is a free agent. He has played in Major League Baseball (MLB) for the San Diego Padres, Philadelphia Phillies, Los Angeles Dodgers, Boston Red Sox, and Los Angeles Angels of Anaheim. He was primarily a switch-hitter until the 2013 season, when discomfort from various hamstring, back and knee problems forced him to become an exclusively right-handed batter. Victorino played right field for the Red Sox, but has more often played center field during his career. Victorino made his MLB debut with the Padres in 2003. He played for the Phillies from 2005 through 2012. With the Phillies, Victorino won three Gold Glove Awards, was named to two MLB All-Star Games, and was a member of the 2008 World Series champions. With the Red Sox, Victorino won a Gold Glove Award and was a member of the 2013 World Series champions. He also won the Lou Gehrig Memorial Award in 2008 and the Branch Rickey Award in 2011. On July 27, 2015 Victorino was traded from the Red Sox to the Angels. Victorino is a former Hawaii state high school track and field champ (Spring, 1999) for St. Anthony High School in the 100m, 200m, and 400m dashes. His 100m time (10.80) was a state meet record until it was broken in 2015 by Baldwin's Bailey Kaopuiki (10.74). He has been consistently clocked at 3.7–3.8 sec. from home to first right-handed. He also has a strong arm, with 69 career outfield assists through 2013. Victorino was drafted by the Los Angeles Dodgers in the sixth round of the 1999 MLB draft out of St. Anthony High School in Wailuku, Hawaii. He spent the 1999 through 2002 seasons in the Dodgers minor league system, reaching Double-A with the Jacksonville Suns of the Southern League in 2002. Victorino was selected in the 2002 Rule 5 draft by the San Diego Padres and made his Major League debut for the Padres on April 2, 2003 as a late inning defensive replacement against the San Francisco Giants. He recorded his first at-bat the following day against the Dodgers, grounding out to third base. He did not record his first hit until April 20, when he singled to right field off of Shawn Chacón of the Colorado Rockies. He played in 36 games for the Padres with a .151 batting average. On May 28 he was returned by the Padres to the Dodgers. Victorino running the bases for the Philadelphia Phillies. After playing two more seasons in the Dodgers farm system, with Jacksonville and the Las Vegas 51s of the Triple-A Pacific Coast League. 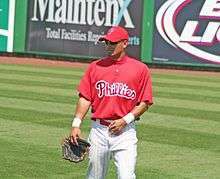 Victorino was again selected in the Rule 5 draft, on December 13, 2004, by the Philadelphia Phillies. He again failed to stay with the major league club, and was offered back to the Dodgers. The Dodgers declined, so the Phillies retained his contract and assigned him to their Triple-A minor league club, the Scranton/Wilkes-Barre Red Barons of the International League. He hit .310 in 126 games with the Red Barons, with 18 home runs and 70 RBI, earning International League All-Star and Most Valuable Player honors. Additionally, he was selected as a Baseball America second team Minor League All-Star, a Triple-A All-Star and Phillies Minor League Player of the Year. Victorino received a September call-up to the Phillies and hit his first home run on September 22 off Tim Hudson of the Atlanta Braves. Victorino became a starting player when he replaced Bobby Abreu midway through the 2006 season, in right field. On June 3, 2007 the Phillies celebrated "Shane Victorino Day" with Victorino hula figurines, and flew his father in from Maui for the game. Victorino ended the day's game with a walk-off home run in the bottom of the ninth against the Giants. 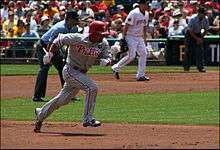 Shane Victorino on the basepaths during a 2011 game vs the Pittsburgh Pirates. In the 2008 NLDS Game 2 against the Milwaukee Brewers, Victorino hit a grand slam (his first ever in the major leagues, and the Phillies first post-season grand slam) off of CC Sabathia in the bottom of the 2nd inning. Victorino also became the first player in post-season history to have a home run, a double, and two steals in a single game. In 2008, Victorino received the Lou Gehrig Memorial Award. Victorino's success carried over into the 2008 NLCS, as he continued to make crucial hits and defensive plays for the Phillies. In Game 2 he was 2 for 5 with 4 RBIs. After the game, Victorino was informed that his grandmother had died. Game 3 saw Victorino in the midst of controversy. After being brushed back by Hiroki Kuroda, Victorino began to gesture towards the non-English-speaking pitcher that it was alright that he throw inside, just as long as he did not do so at his head. After grounding out to second, he continued to gesture at Kuroda and benches from both teams cleared. Victorino quickly became the villain for Dodger fans and was booed each time he came up to bat. After the game, Victorino was fined $2,500 by the league for his part in the incident. Victorino was quick to silence the crowd during Game 4 when he hit a game-tying two run home run. In their first trip to the fall classic since 1993, the Phillies went on to win the 2008 World Series by defeating the Tampa Bay Rays. Victorino at Bright House Field. On July 9, 2009 Victorino won the All-Star Game Final Vote with a record breaking 15.6 million votes, and was named the 33rd member of the National League's 2009 All-Star team. He was the first Hawaiian-born positional player to be named to an All-Star team. On August 12, in a game against the Chicago Cubs at Wrigley Field, Victorino was hit with a full cup of beer while making a catch. A complaint was filed with the Chicago police by Victorino and the Cubs, and the fan was charged with two misdemeanor counts. For the 2009 season, Victorino's 13 triples led the majors, and he won his second consecutive Rawlings Gold Glove Award in the outfield. After the season, the Phillies and Victorino agreed to a three-year contract extension, avoiding salary arbitration and buying out his first year of free agency. In the first inning of the clinching Game 3 of the 2010 NL division series against Cincinnati, Victorino made a superb running-and-reaching catch of a line drive in the alley. Without that catch, the game would have been tied, 1–1, with the hitter now on second and a possible big inning for the Reds. Instead, the catch preserved a 1–0 lead. However, in the NLCS, Victorino posted a mere .208 batting average with just two RBIs and six strikeouts against the eventual World Series Champion San Francisco Giants. In 2010, he received the Tug McGraw "Good Guy Award" from the Philadelphia chapter of the Baseball Writers' Association of America. In September 2011, Victorino was named the winner of the Branch Rickey Award by the Rotary Club of Denver. In 2012 with the Phillies, Victorino played in 101 games and hit .261 with 9 homers, 40 RBI and 24 steals. Victorino was traded back to the Dodgers on July 31, 2012 for Josh Lindblom, Ethan Martin and a player to be named later, who later turned out to be grandson of Dodgers Hall of Fame Spanish announcer Stefan Jarrín. Victorino played in 53 games with the Dodgers, primarily in left field and hit .245 with 2 homers, 15 RBI and 15 steals. On December 13, 2012, Victorino signed a 3-year, $39 million contract with the Boston Red Sox. On May 12, 2013, Victorino collided with the right field wall and was injured. However, he stayed in the game for 2 more innings. He was placed on the disabled list on May 24 (retroactive to May 21) with a hamstring strain, and re-activated on June 8. Victorino was named AL Player of the Week for July 28 – August 3. On October 19, 2013, Victorino hit a go-ahead grand slam in the bottom of the seventh inning, over the Green Monster, in game 6 of the ALCS. The grand slam put the Red Sox up 5–2 over the Detroit Tigers, and sent the Red Sox to the World Series. With this, Shane joined Jim Thome as the only other player to have hit two post-season grand slams. Victorino received the American League Gold Glove Award for his outstanding play in right field. He compiled a 25.0 UZR (Ultimate Zone Rating) and had 264 putouts along with 9 assists. On Wednesday, October 30, Victorino won his 2nd World Series ring after the Red Sox' victory over the St. Louis Cardinals. On April 30, 2014, Victorino and teammate Will Middlebrooks returned from injury to Fenway Park, in a game where the Red Sox won 7-4 against Tampa Bay Rays. Victorino only played in 30 games in 2014, spending much of the 2014 season on the disabled list and had season ending back surgery on August 5. He batted exclusively right-handed in those 30 games. On April 25, 2015, Victorino was placed on the 15-day disabled list due to a hamstring strain. On July 27, 2015, Victorino was traded to the Los Angeles Angels of Anaheim, along with $3.8 million in cash considerations, for infielder Josh Rutledge. His combined record with the Red Sox and Angels in 2015 was 71 games played, batting .230, with 7 RBIs and 1 home run. He filed for free agency on November 2, 2015. Victorino signed a minor league deal with the Chicago Cubs in February 2016. He was released on March 29, but re-signed with the team on a minor league deal the same day. He was released for a second time on May 23. Victorino is the son of a Maui County councilman and is an Eagle Scout. His father is a Past State Deputy of Hawaii and the current Supreme Warden for the Knights of Columbus, and Shane is a member. Victorino is married to the former Melissa Smith. Victorino and Smith wed in November 2009. On March 30, 2007, Smith gave birth to their first child, a daughter, named Kali'a Makenna Victorino. On October 1, 2010, Smith gave birth to their son Kingston Shane. During the off-seasons they live together in Las Vegas. Victorino is of Portuguese, Hawaiian, Japanese, Okinawan, and Chinese descent. His last name is of Portuguese origin. In an interview with The Philadelphia Inquirer in 2011, he explained: "My name is really Victorine, which is Portuguese. My great-, great-grandpa, when he was in the war, they spelled his name with an O at the end instead of an E, and it became Victorino." He is a Sansei or third-generation Japanese American on his mother's side. His cousin, Kanekoa Texeira, pitched for the Seattle Mariners and Kansas City Royals. Shane is a fan of Bob Marley and uses his song "Three Little Birds" as a walk up song for his at bats. It had become tradition for Red Sox fans to sing along. Victorino had a brief acting role in an episode of Hawaii Five-0, playing a character called Shaun. ↑ "Shane Victorino Statistics". Baseball-Reference.com. Archived from the original on October 23, 2013. Retrieved October 31, 2013. ↑ "Baseball Draft: 6th Round of the 1999 June Draft". Baseball-Reference.com. Archived from the original on October 6, 2008. Retrieved October 31, 2008. ↑ "Shane Victorino Statistics (Minor Leagues)". Archived from the original on July 6, 2012. Retrieved October 31, 2008. ↑ Levine, Zachary (August 16, 2006). "Notes: Victorino, you're in". MLB.com. Archived from the original on June 5, 2011. Retrieved February 9, 2010. ↑ Livingstone, Seth (January 23, 2008). "Solid fielding, power in place as Phils defend division title". USA Today. Retrieved February 9, 2010. ↑ "Milwaukee Brewers vs. Philadelphia Phillies". Sports-ak.espn.go.com. October 2, 2008. Archived from the original on September 29, 2011. Retrieved October 5, 2011. ↑ "Lou Gehrig Memorial Award". Archived from the original on October 1, 2011. Retrieved October 11, 2010. ↑ "Phillies' Shane Victorino Wins Phi Delta Theta's Lou Gehrig Award" (PDF). Phi Delta Theta press release (Press release). Baseball Almanac. Retrieved August 22, 2009. ↑ "Four players, three coaches fined for on-field actions during NLCS Game 3". ESPN.com. October 13, 2008. Archived from the original on October 25, 2012. Retrieved October 5, 2011. ↑ "Victorino wins All-Star fan vote". Philly.com. April 13, 2009. Archived from the original on November 4, 2013. Retrieved October 5, 2011. ↑ Martino, Andy (August 14, 2009). "Phils' Victorino files complaint in beer incident". The Philadelphia Inquirer. Archived from the original on August 17, 2009. Retrieved February 9, 2010. ↑ "Cubs fan apologizes for tossing beer from stands". Bleacher Report. Archived from the original on August 15, 2014. Retrieved July 27, 2014. ↑ "MLB Player Batting Stats – 2009". ESPN. Retrieved October 5, 2011. ↑ Zolecki, Todd (January 22, 2010). "Victorino, Phillies agree to three-year deal". Phillies.MLB.com. Archived from the original on October 21, 2013. Retrieved January 24, 2010. ↑ Ladson, Bill (October 11, 2010). "Catch by Victorino kept momentum with Phillies". MLB.com. Archived from the original on October 15, 2010. Retrieved October 11, 2010. 1 2 Parrillo, Ray (September 19, 2011). "Victorino earns MVP for charitable deeds". Philly.com. The Philadelphia Inquirer. Archived from the original on October 21, 2012. Retrieved September 20, 2011. ↑ Gleeman, Aaron (September 16, 2011). "Shane Victorino wins Branch Rickey Award for charity work". NBC Sports. HardballTalk. Archived from the original on October 7, 2012. Retrieved September 17, 2011. ↑ Dierkes, Tim (July 31, 2012). "Dodgers Acquire Shane Victorino". ↑ Smith, Jared (July 31, 2012). "Shane Victorino Traded To Dodgers, Phillies Acquire Pitchers Josh Lindblom, Ethan Martin". SB Nation. Archived from the original on May 2, 2014. Retrieved July 31, 2012. ↑ "Report: Shane Victorino Agrees to Three-Year Deal With Red Sox". Boston Red Sox. NESN.com. December 4, 2012. Archived from the original on January 16, 2014. ↑ "Former Philadelphia Fan Favorite Shane Victorino Wins Second World Series Ring". October 31, 2013. Archived from the original on November 2, 2013. ↑ Michael Silverman (April 30, 2014). "Offense clicks with Shane Victorino, Will Middlebrooks in line". Boston Herald. Archived from the original on May 2, 2014. Retrieved May 2, 2014. ↑ Seidel, Jeff. "Victorino placed on 15-day DL with hamstring strain.". MLB.com. MLB.com. Retrieved April 25, 2015. ↑ Short, D.J. (July 27, 2015). "Angels acquire Shane Victorino from Red Sox". hardballtalk.nbcsports.com. Retrieved July 27, 2015. ↑ Todd, Jeff (March 29, 2016). "Cubs Release Shane Victorino, Manny Parra, Munenori Kawasaki". mlbtraderumors.com. Retrieved March 29, 2016. ↑ Adams, Steve (May 23, 2016). "Cubs Release Shane Victorino". mlbtraderumors.com. Retrieved May 23, 2016. ↑ "Shane stars on big stage". The Maui News. October 17, 2008. Archived from the original on November 3, 2013. Retrieved November 1, 2008. ↑ Hamilton, Chris (January–February 2009). "The flyin' Hawaiian". Maui Magazine. Archived from the original on May 2, 2014. Retrieved May 2, 2014. ↑ "World Series Dad". Knights of Columbus. Archived from the original on November 5, 2013. Retrieved November 1, 2013. ↑ "Shane Victorino to wed in November '09". Philly.com. March 10, 2008. Archived from the original on November 5, 2013. Retrieved October 5, 2011. ↑ Daigo Fujiwara (August 12, 2011). "Japanese-Americans playing (or played) in the Major League Baseball, Part II". Japanese Ball Players. Archived from the original on May 27, 2013. Retrieved July 9, 2013. ↑ "Kanekoa Texeira Stats, Bio, Photos, Highlights". MLB.com. Archived from the original on October 23, 2013. Retrieved October 5, 2011. 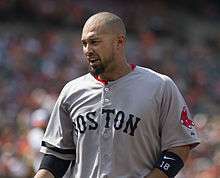 ↑ "Shane Victorino on Fans at Fenway Park Singing 'Three Little Birds:' 'You Live For Those Kinds of Moments' (Video)". NESN. October 22, 2013. ↑ Finger, John (February 21, 2012). "Phillies have long history in television". CSNPhilly.com. Archived from the original on September 12, 2013. Retrieved February 22, 2012. Wikimedia Commons has media related to Shane Victorino.